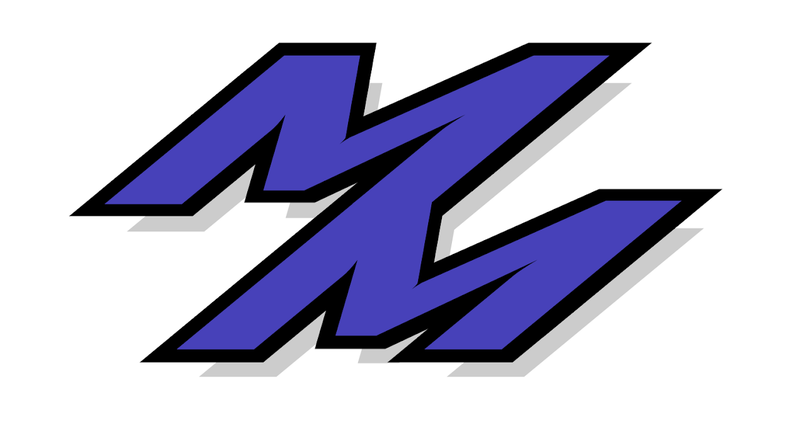 Monnar Motorsports: SCCA Final Points Event! Well this is it everyone! Do or die was how I felt today as I was really aiming for 3rd Place for the year. Results haven't been posted yet due to software problems apparently, but I have a good feeling I've secured 4th place in SM. Out of how many, unsure of that as well. The event overall was pretty hectic as it was the Stirling Moss Run Offs, so we had no lunch break and were racing until almost 6pm with only 5 runs for the day. The weather was very cold out, to the point I was wearing a sweater and a leather jacket with a hat. The car said it was 60 out, but the cold wind is what made it worse I think. This was great practice for racing in the cold though, as I have to learn some time or another. 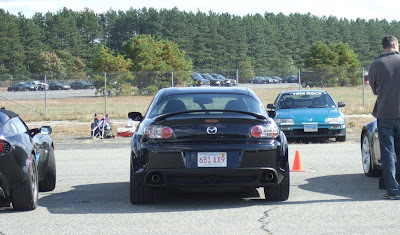 I was still running with my summer settings of 8 clicks in the front and 6 clicks in the rear on my dampers, with 29 PSI in the front and 32PSI in the rear. As I took my morning runs, I had to play it easy as the car felt very uneasy, like walking on glass. The slightest touch of the gas pedal and I could lose it or something. After talking with Brian and Keith (Thanks again, appreciate it big time guys) I learned a great setting for the cold that made the car feel very planted, and even better than my previous setting in the hot. Full soft rear, 2 clicks in the front with 28PSI in the front and 30PSI in the rear. It is just too bad that I figured this out on my last run only, getting me higher than desired times. But it is all a learning process and I'll know for next year for sure. 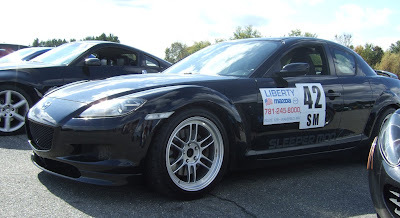 I'll be updating this post with a link to the results as soon as they are released, but for now enjoy the pictures and hopefully see everyone at SCCA for the last event, SCCA Team Challenge! 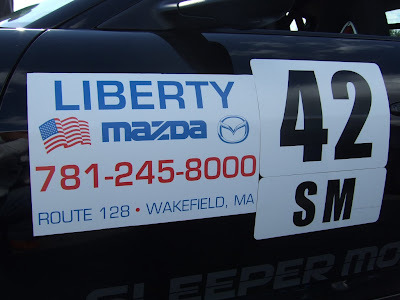 Check out what the new Liberty Mazda magnet! Trimmed off the edges and fit perfect next to the numbers. UPDATE: Results have been posted! Check out the Final Results of the day, the Pax Time Results, and Final Raw Results.